This photograph of St. Paul's Cathedral from the 'Walter Hawkins Nightingale (PWD) collection: Album of views of Calcutta, was taken by an unknown photographer in the late 1870s. 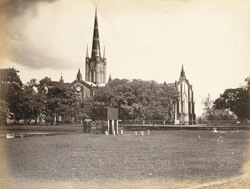 Located on the south-east corner of the Maidan, St. Paul's Cathedral was designed by Major W. N. Forbes in an Indo-Gothic architectural style and built in 1839. Rev. Daniel Wilson, the Bishop of Calcutta was the major financial contributor towards the building of St. Paul's Cathedral.